"Baby A"... Yea, lets all go ahead and say it... "Awww..." This precious little girl is something else. 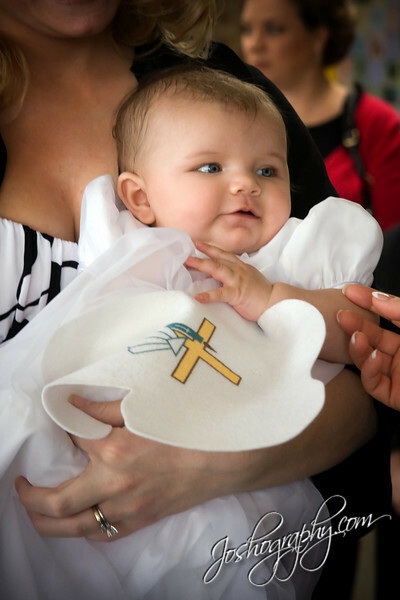 Going through a baptism at 5 months old, she didn't even fuss, cry, or have any problems with the whole event. During the actual ceremony, she even stopped looking at Father Frank, turned and looked at her mom, and then rolled over to look right at me and my camera, as if to make sure that I was getting her good side. :) Adorable. She comes from an adorable family, and I cannot thank them enough for giving me the opportunity to capture these moments for them. It was a great event for me, as my first baptism that I have had the chance to photograph. Click the image to go to the gallery.